I am working on the way of life for the Dedicated Widows of the Holy Eucharist I am in the process of co-founding. We have to write a section on the Eucharist. My take, as a daily communicant, is that Jesus, the Bridegroom, is leaping down from heaven, to come right inside me. 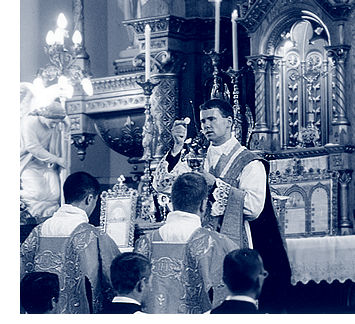 And, perhaps, even more dramatically – if the seminarians don’t persevere, we will starve. Already some parishes in the US have a priest once a month and Communion Services the rest of the month. Some parishes no longer have daily Mass. Fr. Tony Anderson, SOLT, is pastor of 90,000 Mexicans. Priests are an endangered species. Pray for vocations. Within the next month you will be hearing from me about a book I edited of Late Vocation stories. It will be called: “Last Call: 14 Men who Dared Answer.” These stories range from former night club managers to international bankers, to a Peruvian considered late vocation at 21 because in his time they took in boys of 7! The hound of heaven isn’t dead yet! Dr. Ronda Chervin has many free e-books and audios on her website rondachervin.com. If you go to her website and read or listen and then want to correspond with her she will be available. Her schedule does not permit, however, responding to comments on the Blog, though she enjoys reading them. Dr. Ronda’s newest project is spiritualityrunningtogod.com.